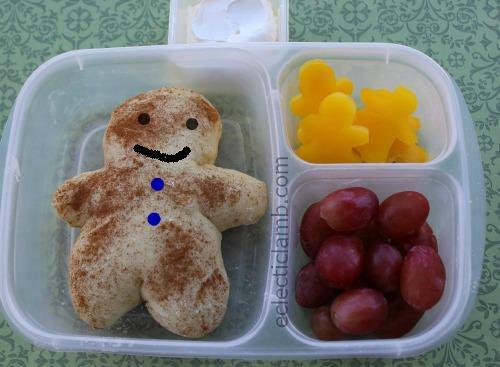 I don’t know why I made a Gingerbread man without a face. Looking at this photo afterwards I almost did not publish it. This was a very simple but well received meal. My shaped bread meals tend to be popular with the people who eat them. This is not the dried blueberries I probably would have used but I think it looks better. Face or no face? Which version do you prefer? They’re both cute. And tasty-looking! I like them both! What a yummy looking lunch!